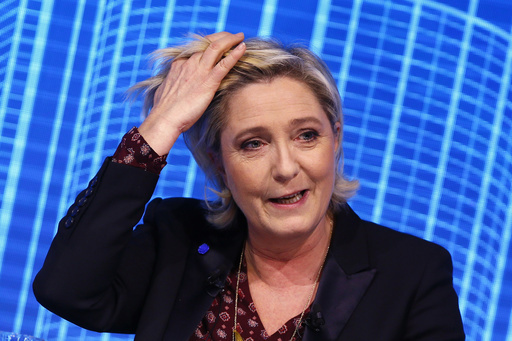 PARIS (AP) — The European Parliament voted Thursday to lift French far-right leader Marine Le Pen’s immunity from prosecution for tweeting gruesome images of violence, a crime carrying a maximum sentence of three years in prison. The legislature voted by a broad majority in Brussels on Thursday to clear the way for the possible prosecution of Le Pen over tweets she made in December 2015 showing executions, including the killing of American reporter James Foley by Islamic State extremists. French prosecutors in the city of Nanterre had asked for the lifting of the immunity that Le Pen enjoys as a member of the European Parliament after they opened a preliminary investigation. Under French law, publishing violent images can carry a penalty of three years in jail and a fine of 75,000 euros. The lifting of Le Pen’s immunity does not relate to another corruption case centered on her aide at the European Parliament, suspected of being paid from EU money while working on behalf. Le Pen’s chief of staff, Catherine Griset, was handed a preliminary charge of receiving money through a breach of trust. The campaign for the election to replace unpopular Socialist President Francois Hollande has been rocked by corruption allegations targeting another top contender, conservative candidate Francois Fillon. Fillon, a former prime minister and once the front-runner in France’s two-round April-May presidential election, announced on Wednesday that he was summoned to appear before judges on March 15 for allegedly using taxpayers’ money to pay family members for jobs that may not have existed. Fillon however vowed to stay in the race. Fillon’s troubles have benefited centrist independent candidate Emmanuel Macron, who on Thursday announced his policy platform, including boosting European unity and combating populism and corruption.